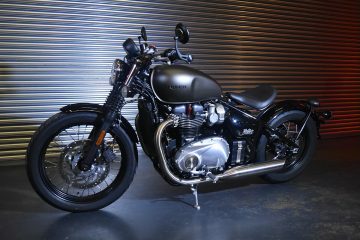 In 2014 Triumph released the limited addition Bonneville Newchurch, named in honour of the small town of Neukirchen, Austria, which changes its name to the more British sounding ‘Newchurch‘, when playing hosts to Triday’s, the celebration of all things Triumph. 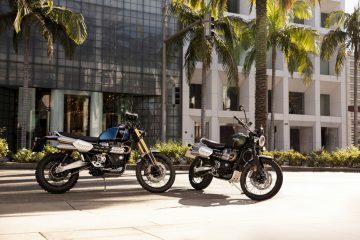 These limited addition machines are described as featuring “fresh new contemporary paint schemes, a new low profile seat … with cool black detailing throughout”, available in “a choice of Cranberry Red / Pure White or Sapphire Blue / Pure White, featuring hand painted black detailing”…. 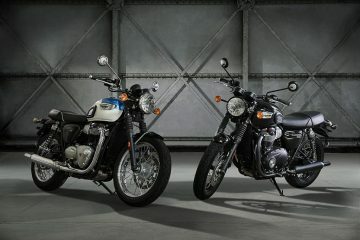 and Triumph were sure that … “owners will use as a perfect starting base … to continue their own customisation ideas”. 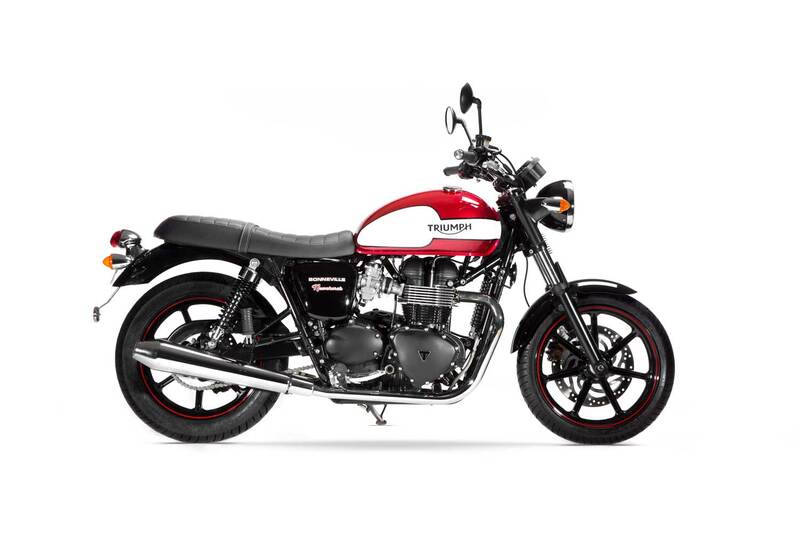 To be honest Triumph, just sell the bikes at a discount without a seat, shocks, handlebars, indicators, exhausts, switches, lights, mudguards…. 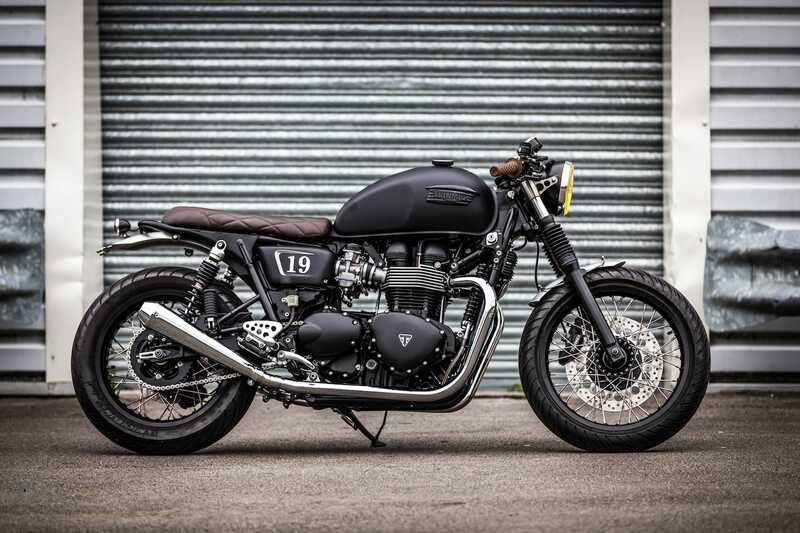 sod it, just sell it in kit form, with the tank in primer, then you really would have “… a perfect starting base for owners to continue their own customisation ideas”. 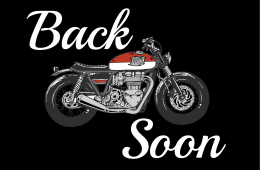 Until that happens, which is unlikely, the mountain of parts taken off Triumph Twins Barnsley based Down & Out Cafe Racers have been building, will just keep growing. 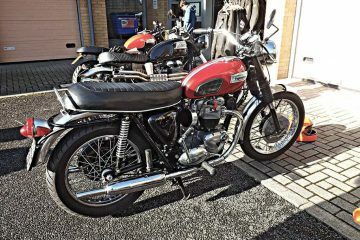 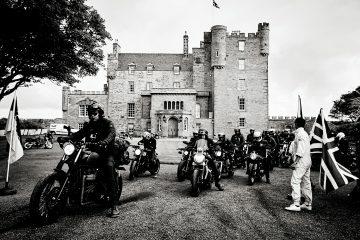 It is that very mountain where many unwanted parts taken from Jon Oliver Bryce’s customsiable 2016 Triumph Neukirchen… sorry Newchurch are now to be found. 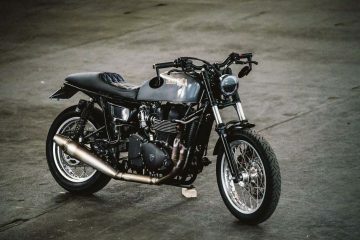 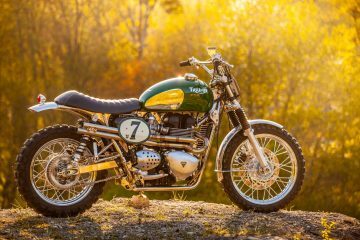 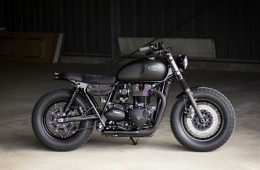 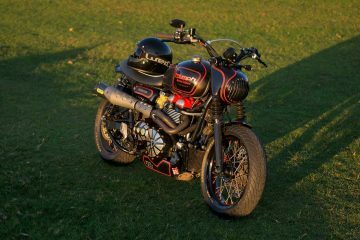 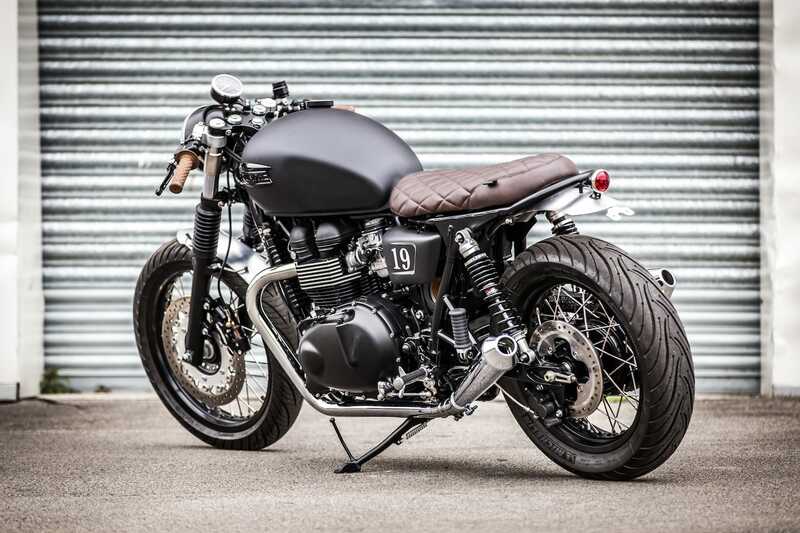 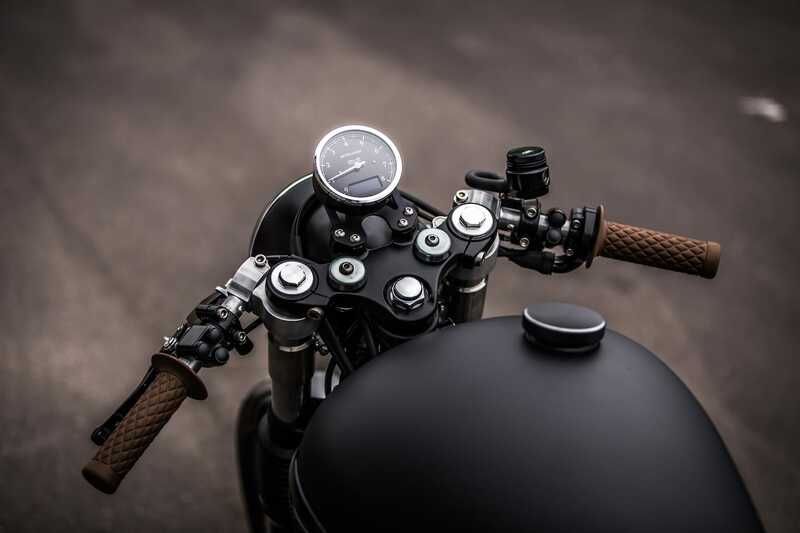 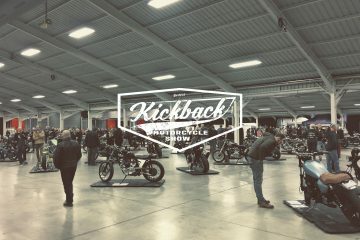 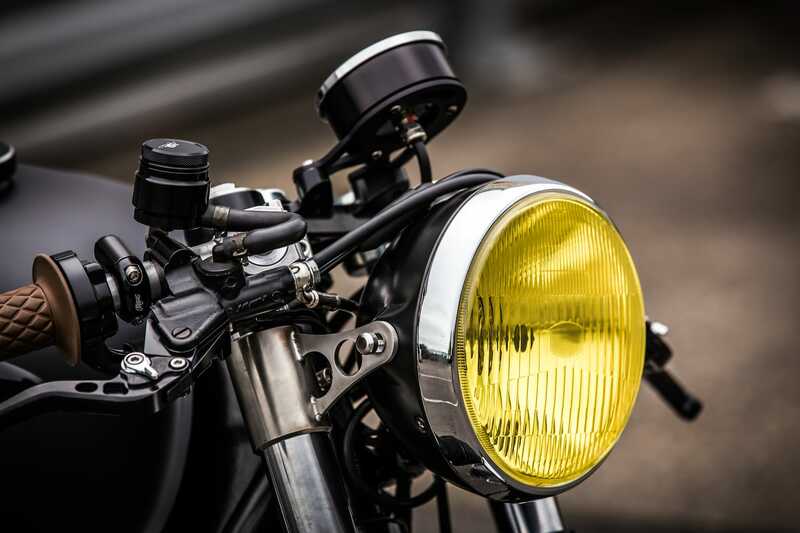 Like Macco Motors, Down and Out Cafe Racers need no introduction, or does their style, a style and quality which is getting the team noticed, even by Triumph themselves. 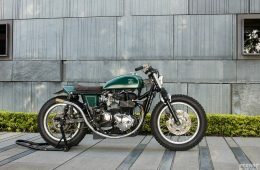 Oli approached D&O with a good idea of what he wanted for his build, with D&O supplying a new Triumph Twin as the donor bike – then, over a four month period the bike took shape. 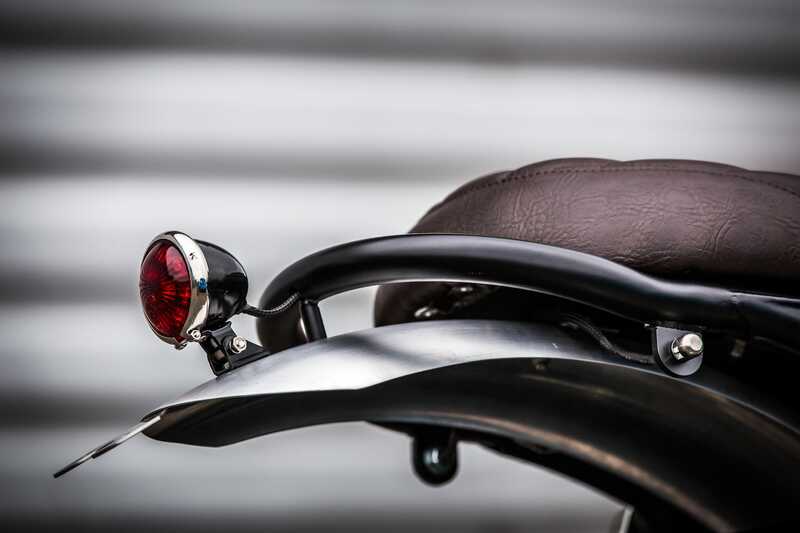 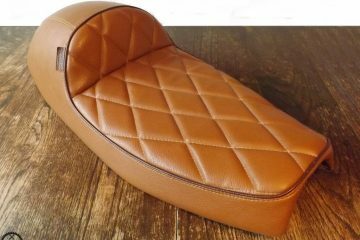 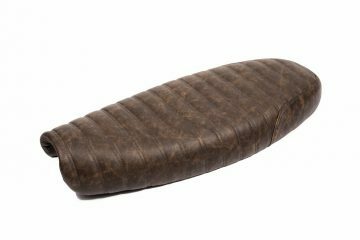 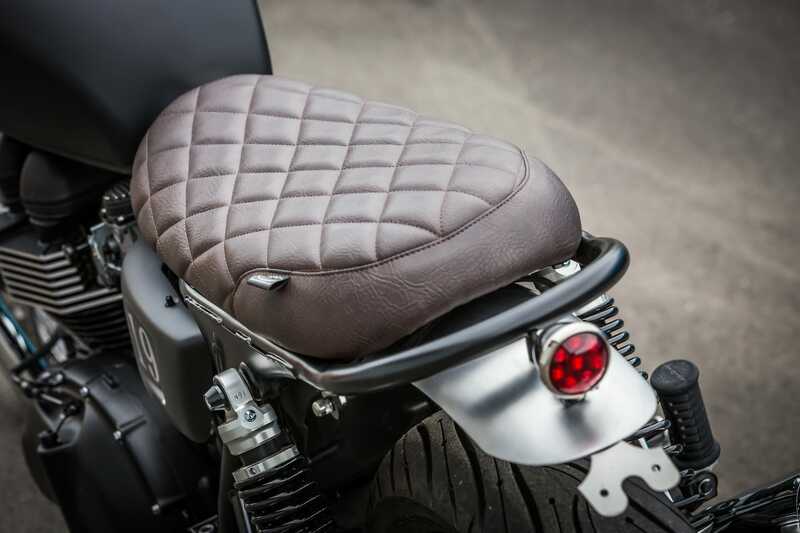 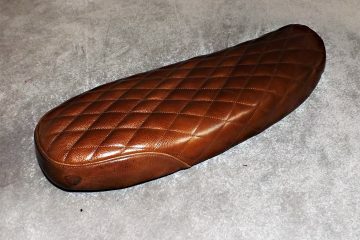 Oli’s Bonneville features all of D&O’s trademark modifications including their frame-loop, rear mudguard, side covers and shorty seat – which in this case has been finished in brown diamond-stitched vinyl. 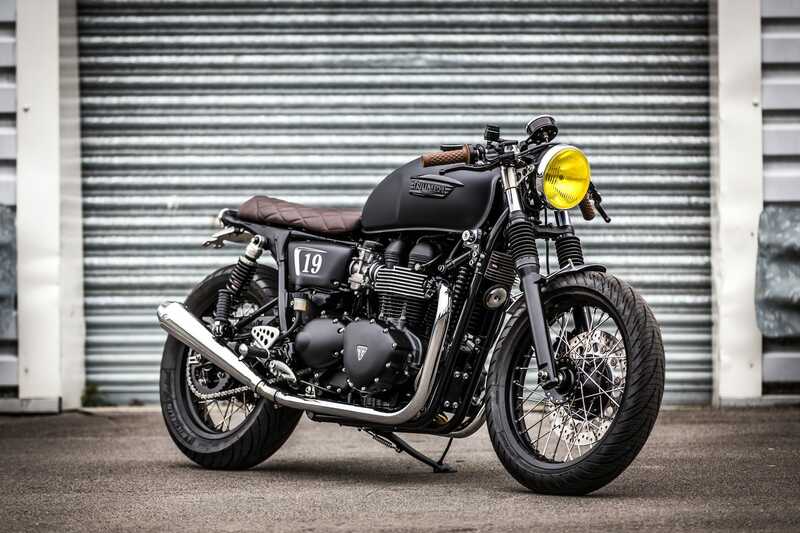 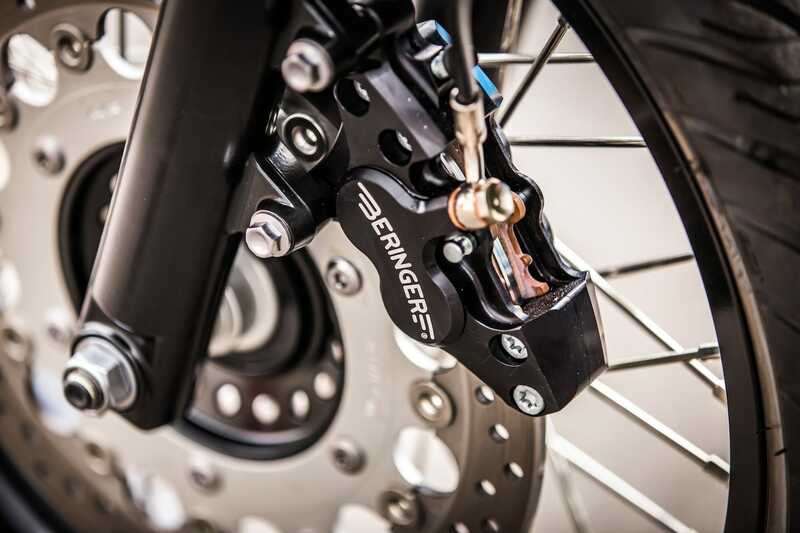 D&O’s online store features a plethora of off-the-shelf parts and accessories, many are fitted to Oli’s Bonneville, such as; D&O’s front mudguard, exhaust cans, headlight, featuring a contrasting yellow lense, and mounted to the Twin using D&O brackets – as well as micro indicators, Thruxton rear sets and the obligatory re-location brackets. 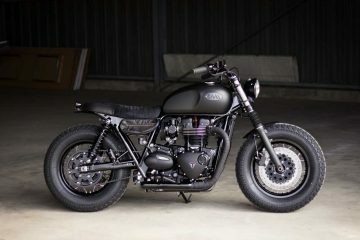 Oli’s Bonneville Newchurch’s original and distinctive paint-scheme which Triumph thought so pretty, has been ditched in favour for a more urban satin black, and ties in perfectly with the Motogadget Chromoclassic Tacho – which looks fantastic paired with the D&O Cafe clip-on bars, fitted with Motone’s micro switches, with all the unsightly wiring routed through the bars. 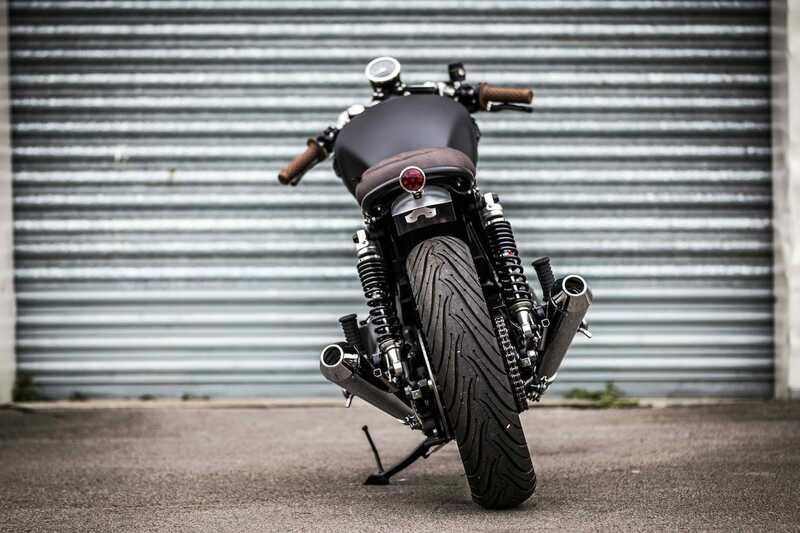 The stock rear springs have been replaced with items from YSS, with the black, hand pinstriped, seven spoke cast wheels, ditched for the better looking spoked wheels from a Thruxton, which have been powder-coated black and fitted with Michelin Tires, with the woeful front brake callipers upgraded to a Bringer.